Exploration company Ocean Infinity has found the ARA San Juan, the Argentine Navy submarine which was lost along with her crew of 44 on November 15, 2017. In the early hours of November 17, after two months of seabed search, Ocean Infinity located what has now been confirmed as the wreckage of the San Juan. The submarine was found in a ravine in 920 meters (3,020 feet) of water, approximately 600 kilometers (370 miles) east of Comodoro Rivadavia in the Atlantic Ocean. She was partially imploded. The San Juan was about 430 kilometers (270 miles) off Argentina’s Patagonian coast when her crew sent their last signal. At the time, the Navy said water had entered the submarine’s snorkel causing a battery failure. Argentina's defense minister has not been able to confirm whether or not the submarine can be recovered but said the government did not have the means to do it. Ocean Infinity had committed to conduct the search operation for up to 60 days and to take on the economic risk of the search, only receiving payment if the submarine was found. Ocean Infinity's team, led by Andy Sherrell and Nick Lambert, was supported by the Argentinian Navy and also received help from the Royal Navy and the U.S. Navy’s Supervisor of Salvage and Diving. 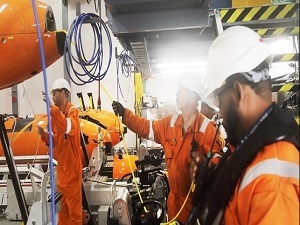 The company used five autonomous underwater vehicles (AUVs) to carry out the search, which was conducted by a team of approximately 60 crew members on board Seabed Constructor. In addition, three officers of the Argentine Navy and four family members of the crew of the San Juan joined Seabed Constructor to observe the search operation. Ocean Infinity’s AUV’s are capable of operating in water depths from five meters to 6,000 meters (19,700 feet) and covering vast areas of the seabed at unparalleled speed. The AUVs are not tethered to their host vessel during operations, allowing them to go deeper and collect higher quality data for the search. They are equipped with a variety of tools including side scan sonar, a multi-beam echo-sounder HD camera and synthetic aperture sonar. In addition, from the host vessel, Ocean Infinity is able to deploy two work class ROVs and heavy lifting equipment capable of retrieving objects weighing up to 45t from 6,000 meters (19,700 feet).